The format remained as four out in the first and second sessions before the top ten were set to be decided in Q3. Sebastian Vettel appeared to be struggling for pace initially but managed to sneak up into the stronger positions towards the end of the session. The fight for pole position initially only ever going to be between Rosberg and Hamilton, but for a moment it looked as though home favourite Felipe Massa could spring a surprise. 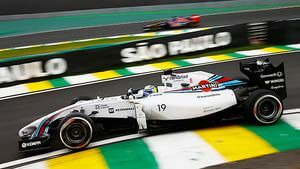 He just missed out and had to settle for the second row of the grid, joined by Williams teammate Valtteri Bottas.